I’m participating in the Write Tribe Problogger October 2017 Blogging Challenge through October and will be following the prompts suggested. I’ve also decided to focus on the theme of Anonymously Me – stories that people have shared with me and that we could all learn lessons from. 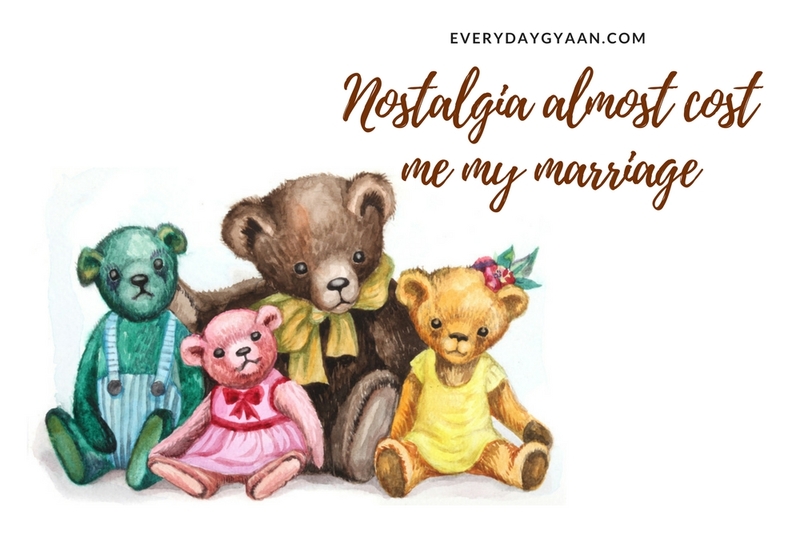 Today’s Anonymously Me story, Nostalgia Almost Cost Me My Marriage’ comes from a woman in her mid-thirties who lives in urban India. If you have a story you’d like to share anonymously on Everyday Gyaan, do contact me. You can be assured that I will keep your name and details confidential. Is it possible to be too nostalgic? Is too much nostalgia a bad thing? Perhaps, we should ask that of Lot’s wife, who in the Biblical story looked back and turned into a pillar of salt! In the 1600s, the ‘disease’ was considered similar to paranoia – with sufferers exhibiting melancholy and loss of appetite. Malnutrition, inflammation of the brain, feverishness, seeing ghosts, hearing voices and cardiac arrest were also symptoms slapped under the nostalgia umbrella. The ‘dangerous’ condition was mainly associated with those sent away from home for long periods – children, domestic servants and soldiers (in the army, nostalgia was occasionally punishable by death). Other causes were thought to be poor education, masturbation, love and being a mountain-dweller. In the 19th century, doctors even thought nostalgia was the product of a ‘pathological bone’ in the human body (unsurprisingly, they couldn’t locate it). Treatments included leeches, stomach purges and the terrifying sounding ‘warm hypnotic emulsions’. For someone who is committed to living in the present, I am not so hung up on nostalgia. I often think that we idealize what was and make it into a beautiful time that we yearn to go back to. It often takes us away from reality. So to me, although nostalgia is not an illness, being wrapped up in it can be a way of escaping our present. I’m embarrassed to tell this story in my own name, but I feel I must share it with you. I’ve been in and out of love many times. A huge romantic, sometimes I think I was more in love with the notion of love than the reality of it. It was only when I was in my late 20s did I meet someone who I got seriously involved with. I met this stereotypical tall dark and handsome guy online and we started chatting with each other. He was fun. He seemed successful. And I fell for his charms pretty quickly. We lived in two different cities, but couldn’t wait to meet each other. Within a month, we planned a meeting and decided that we’d go on a holiday together. He met me with flowers and chocolates at the airport. We had a great time and were drawn into a physical relationship. Even in that brief time, there were arguments and one huge tantrum from him. Quick to see everything through the lenses of love, I put it down to his passionate nature. Reluctantly, we went back to our respective cities, but would make sure we met at least once a month. Long chats, gifts and lots of loving text messages kept us going between meetings. I found his need for a privacy a bit odd, but he told me that it was for my sake. When he stormed out of the hotel we were staying in after a big fight, I rifled through his stuff and found his passport that told me he was married! Heart-broken, I ended our relationship immediately. A few years later, through common friends, I met the man who became my husband. He didn’t have the dashing personality or charm of my ex. His friends spoke highly of him and he came across as a very loving person. I soon fell in love with my husband. He saw me through illness, the loss of my parents, my pregnancy and the birth of my daughter. In other words, I had no reason to be unhappy with my husband. When my husband failed to get me flowers and gifts for our anniversaries, or make big, romantic gestures, I would be upset. This would start off a spiral of looking back on the relationship with my ex with nostalgia and longing. After the birth of my daughter, this got worse. I would take out all the teddy bears that my ex had given me (and I stupidly kept) and look at them longingly. Nostalgia would lead to bouts of sulking and temper tantrums. I couldn’t tell my husband what was bothering me, and he, poor guy, tried to his best to find out. I was ashamed at myself. How could I look back with longing on a cheat (oh yes, I forgot to tell you that he took large sums of money from me) and a philanderer? But I did. One day, when I almost threw a vase at him, I realized that this trip down nostalgia lane was getting too much. I sought help. I spoke to friends and eventually sought counselling. My counselor, through various exercises, made me realize how blessed I was in my husband. She also helped me to work on parts of myself that needed healing. I realized that I could be the one to initiate romance in my marriage. And I’m happy to report that I did. And I said good-bye to those damn teddy bears as well! I hope my story can help another woman somewhere to learn to live in the present and count her blessings. The prompt for this week is ‘Nostalgic’. Use this word in your post. That was a very close call. It’s so good that she realised that living in the past and having the same expectations from her spouse wasn’t helping her. So many of us dwell on the past and the way things were that we forget that the present has loads of opportunities to make good memories too. This is such a great reminder to appreciate and live in the present. Our mind is so strange; it protects us from hurt to the extent of cocooning us in delusion! I am glad you found the courage to seek help and make your life happy and joyous again! I have found that in life we always get things with balance; its the missing things that make us miserable and our reasons for wanting those missing things will be so flimsy that even we will be ashamed to admit it! When we talk of nostalgia, it is usually with fondness. After all, it is always the ‘good, old days’. What is never mentioned is the unsaid rule that nostalgia is a place to visit, not to stay. Loved this story. Oh yes to some the past seems so wonderful. An escape. A friend of mine, since we were 5, told me about something in OUR past that did not ring true. I called her on it and she laughed and said she forgot who she was talking to! We both laughed. If she wants to tell others this whitewashed story so be it but I know the truth. The past can destroy the future and definitely cloud the present. I agree with you about nostalgia being an idealisation of the past that should remain in the past! More power to you for the courage for confessing on a public forum and it shows that you are a strong person. I am normally an emotional person and where nostalgia keep playing a huge part in my life, forever veering between the past and present. It can be both empowering, life defining but fettering growth at the same time. Great story and lesson. I’m glad her husband was patient – that’s love! Loved the way you have told your story.. And so true. when we look at the past it somehow seems better than the present, which is not always the case. May be we just remember the good aspects of past and keep them close to our heart. I am glad you realized in time and saved your marriage. Thanks for sharing as now I will be cautious about this aspect of remembering the past too much. Getting stuck in the loop of the past can be dangerous and it always costs our present or future relationships. I’m glad she realized that her love life is slipping away and had some help to save it. It’s always better to “let it go”. I think sometimes even when relationships fail, if we haven’t been able to let go, we hold on to the good times in an idealised way and that is bound to ruin any future relationships. Therapy is always a good idea and glad you were able to seek help with the same. Nostaligia to me is a time machine. I always found joy on most days and a bitter sweet melancholy on some days when I indulged a little in the memories of the past.. but your trivia and the story opened up a new dimension. I guess extreme of everything , including nostalgia can be harmful to people and relationships..
We all take trips down memory lane but if it becomes an obsession then that is very unhealthy. How can a woman allow a relationship with a decent, caring man slip away due to longing for a person who had caused her such harm, but was passionate and exciting nevertheless? Thankful that she woke up in time, and did the hard work to save her marriage. Much praise for her. Comparisons could destroy any relation be it a marriage or friendship… One should be happy in the present and stop dwelling on past and pile up lot of expectations for future…I am glad that she took help at right time which saved her marriage. Very good and true post! It is very true that we generally compare things with our past. However, those who understand that the present is meant to be, live happy. Thanks goodness the lady in the story could think of seeking help through counselling. Some men are good to love and others to show love, though the latter type can create a deep impression in female mind. I read somewhere, woman are more attracted to men who are naughty and wicked rather than the easy-peasy plain ones. Serious contradictions! Your story, I’m sure should help some to get out of the vicious web of love-confusion they got entangled themselves. This actually touches upon a really serious issue that many ignore in relationships even today – allowing comparisons with past relationships to destroy a good thing in the present. Thumbs up for the honest and a bigger one for the course correction in life after realizing what was going wrong. A lot of us hold on to old memories like jewels, conveniently forgetting the pain they had caused us and reminiscing only on the happy parts. I’m glad she was able to rectify her folly in time and start her life afresh. The lesson this woman has learnt is something we all should learn too. Holding onto the ghosts of the past only tie us down, they do not let us live the moment or enjoy what might be ahead of us because we are always looking behind. I am so happy that counselling helped. Sulking in the past can become very toxic, it’s better to bury it and let it go.